Starting July's first post with the breakfast recipe. Only after starting my own blog, I realized that I have quite a lot breakfast recipes. This is one simple recipe which my mom used to prepare often during our childhood days. Ofcourse she had to make changes because my Dad doesn't like onions to be in these Rava Roti. He would be happy if she puts lots of grated coconut in these. It was a big No for me as I preferred less coconut and lots of onions. Poor Mom, she used to divide and alter it according to our taste. 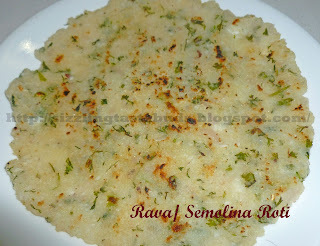 Semolina in Kannada is called as "Rava" and Roti ofcourse Roti/ Rotti. Its preferable to use medium sized rava for this. In Uttara kannada, people call this kind of Roti as " Thali peat". 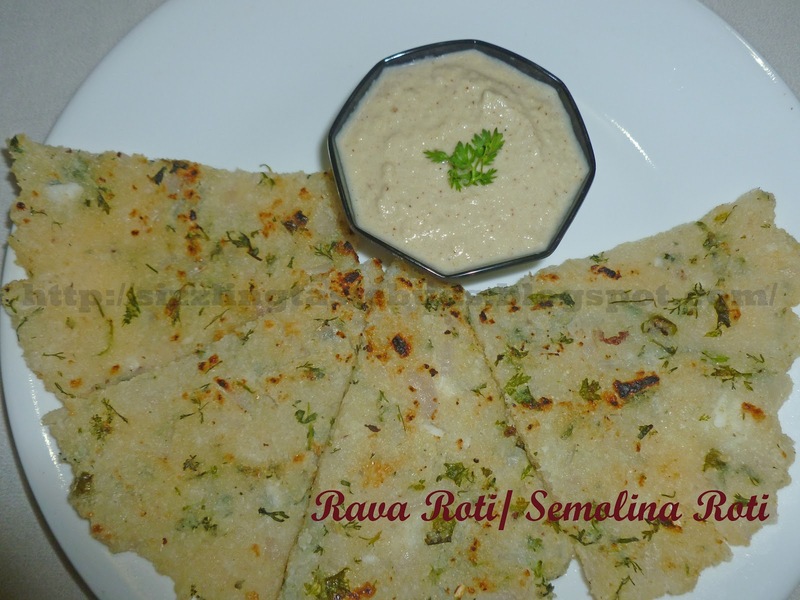 So here's the recipe of simple and easy Rava Roti. Try it out . 1. Take a bowl and mix Rava, chopped onions, green chillies, Salt, grated coconut, coriander leaves and sugar by adding water. 2. Let it soak for atleast 10 mins. Mixture should not be too watery nor too hard. 3. Spread a 2 tsp oil on a heated tava. Take a laddle full of mixture and place it in the center of the tava and try to spread it evenly by pressing the mixture slowly with the laddle. This is the way we prepare this Roti. If you are not comfortable with this method, try to make the rava mixture little hard and make balls. Take these balls over a greased plastic sheet or butter paper and spread to a round shape by pressing it with your fingers. Slowly shift this to the greased tava. Try to spread it as thin as possible. 4. Cook it in medium flame covering it with a lid. Flip it after 2 mins and cook it the other end till it gets slightly roasted. Try this out and let me know how it tasted.